China launched on Friday, February 2, its first seismo-electromagnetic satellite, known as Zhangheng-1, atop a Long March 2D rocket. Six other smaller satellites also piggybacked on the mission. The launch vehicle soared into the sky at 7:51 GMT (2:51 a.m. EST) from Launch Area 4 (LA-4) at the Jiuquan Satellite Launch Center (JSLC) in China’s Gansu Province. Chinese media has not disclosed any details about the preparations for the mission and about Long March 2D’s ride into space. The officials postponed the mission from August 16, 2017, not offering any explanation behind this move. 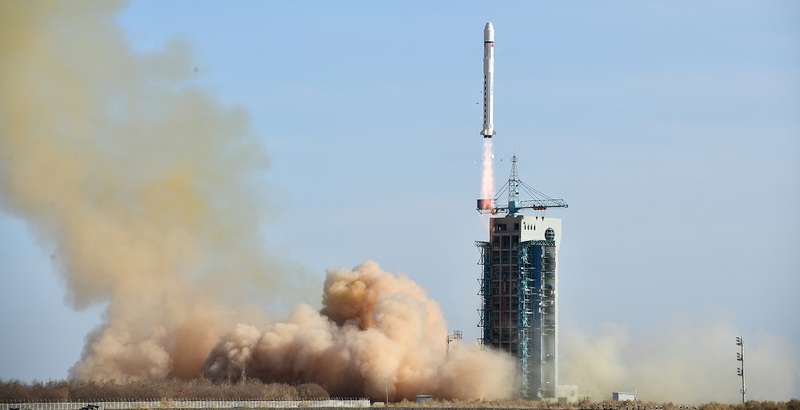 Long March 2D’s flight most likely concluded within 10 minutes after liftoff given that it delivered its passengers into a Sun-synchronous orbit (SSO). The nominal flight timeline of this rocket includes first stage separation about two and a half minutes after launch, and payload fairing detachment approximately one minute later. Therefore, the second stage controls the flight for the remaining 7 to 8 minutes in order to deploy the payload into targeted orbit. The success of the mission was confirmed by the state-run Xinhua press agency, within 50 minutes after liftoff. The primary payload of Friday’s mission is the Zhangheng-1 experimental seismo-electromagnetic satellite, also known as the China Seismo-Electromagnetic Satellite (CSES). The mission is a joint Chinese-Italian project dedicated to the observation of ionospheric precursors of earthquakes. Zhangheng-1 was inserted into a SSO at an altitude of about 310 miles (500 kilometers), inclined 98 degrees, and will be operated jointly by the China National Space Administration (CNSA) and Italian Space Agency (ASI) for a period of up to five years. The satellite will measure high-energy particles, plasma, electric and magnetic fields with a set of scientific instruments, including a High Energy Particle Detector (HEPD) and a Search-Coil Magnetometer (SCM). The spacecraft is called an “earthquake investigator” as it will allow scientists to monitor electromagnetic and atmospheric phenomena, and study correlations with the occurrence of seismic events. It should also provide insights into solar-terrestrial interactions, including phenomena like solar flares and coronal mass ejections (CMEs). “It will help scientists monitor the electromagnetic field, ionospheric plasma and high-energy particles for an expected mission life of five years,” said Zhao Jian, a senior official with China National Space Administration (CNSA). Zhangheng-1 was built by the China Academy of Space Technology (CAST) and is based on the company’s CAST2000 platform. The spacecraft weighs about 1,610 lbs. (730 kilograms) and is fitted with a lone deployable solar array. The secondary payload of Friday’s mission includes the GomX-4A and GomX-4B six-unit CubeSats built by the Danish GomSpace company, ÑuSat 4 and ÑuSat 5 satellites for the Argentinian company Satellogic, and also FengMaNiu-1 and Shaonian Xing CubeSats for China. GomX-4A will be operated by the Danish Ministry of Defence and is a technology demonstrator, which has the main goal of identifying best-practice and future efforts reinforcing Denmark’s surveillance of the Arctic. It is fitted with radio receivers capable of capturing position signals from ships and aircraft. GomX-4B, operated by the European Space Agency (ESA), will test inter-satellite links and propulsive orbit control techniques for future constellation operations with GomX-4A. The CubeSat also carries the Cubesat Highly Integrated Memory Radiation Assurance experiment, known as Chimera, which is designed to test how ‘commercial-off-the-shelf’ (COTS) parts cope with bombardments of high-energy electrically charged atomic particles from the Sun and deep space. “The GOMX-4B satellite is the most advanced satellite design we have initiated to date and we are very happy that ESA will participate in this project that will demonstrate possibilities of satellites flying in formation, assess the tandem effect synergy that open the doors to commercial opportunities for using the platform in future constellations for our customers,” said Niels Buus, CEO of GomSpace. ÑuSat 4 and ÑuSat 5 are Earth-observing satellites built and operated by Satellogic. Both spacecraft are identical and weigh approximately 81.5 lbs. (37 kilograms). The duo should replenish Satellogic’s Aleph-1 constellation aimed to deliver commercial Earth-observing services. When completed, the project is planned to consist of 25 spacecraft orbiting in SSO at an altitude of about 300 miles (480 kilometers). FengMaNiu-1 (or FMN-1) is a technology demonstrator developed by Link Space Aerospace Technology Inc., which will be used by the company to test new optical components in space. It will also be used as a repeater for amateurs worldwide via the onboard transponder system. The satellite is a three-unit CubeSat weighing around 6.6 lbs. (3 kilograms). According to Link Space, it will take some time to obtain first results from FengMaNiu-1’s optical system. “We will see the panoramic photo and video in a week,” the company tweeted. Shaonian Xing (“Youth Star” in Chinese) is a three-unit CubeSat with a mass of about 4.4 lbs. (2 kilograms), it was developed by teenagers as part of the Sat-China outreach project. The small satellite will be employed to engage youth in thinking about space, STEAM (Science, Technology, Engineering, Art and Mathematics) education, and satellite development. Friday’s flight was the 266th launch of the Long March rocket series and the third mission conducted from JSLC in 2018. China’s next orbital mission is currently slated to take place on February 11, when a Long March 3B booster will deliver the newest duo of BeiDou-3 navigation satellites into space.